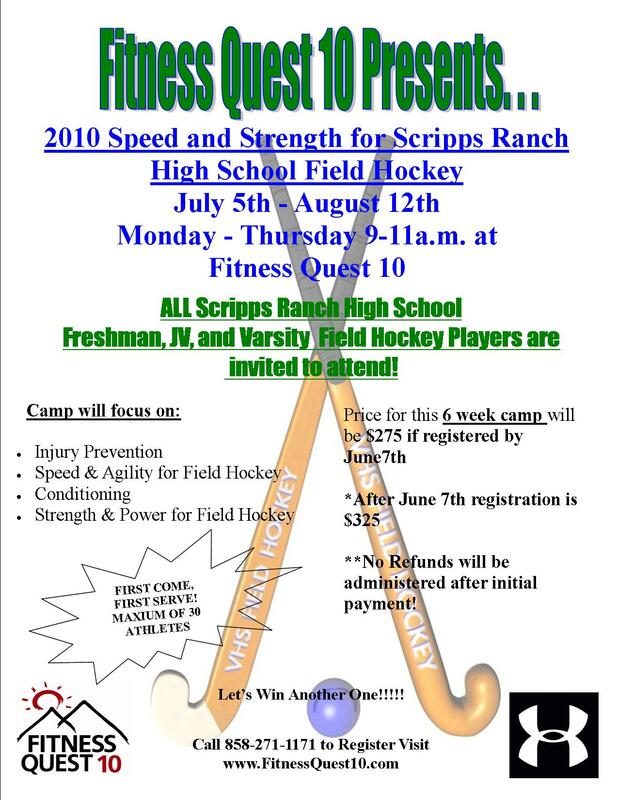 Fitness Quest 10 will be offering a sports-specific speed, strength, and conditioning camps specifically for Scripps Ranch Field Hockey team. This is separate from the other Fitness Quest 10 programs offered for summer. Athletes can attend up to four two hour sessions each week. At least two sessions per week are recommended. ALL Scripps Ranch High School freshman, JV, and Varsity field hockey players are invited to attend! Each year, in the second half of February, we experience a “change of seasons” at Fitness Quest 10 when the Major League Baseball players leave for spring training camp and the NFL players arrive for off-season training. This year, just like the previous few, the seasons overlap and for a couple of weeks and the football and baseball guys actually get to train together. It’s a lot of fun and the inter-mingling between the different sport athletes is unique. Some are getting ready to leave… and some are just starting their off-season, but their quest is the same…to prepare for a championship season. Our pros spend their off-season readying mind and body for the new year. Physical conditioning, mental fitness, nutrition, massage and bodywork, flexibility, and more… Our goal is to have them at the top of their game, physically and mentally, when they report to camp. It’s all about recovery, rejuvenation and retooling the mental and physical playbook to prepare them for a standout season. It got me thinking… maybe some off-season training would be good for all of us. I LOVE my work as a personal trainer, I LOVE off-season training and I LOVE to see Fitness Quest 10 filled with the Joes and the Pros, but sometimes it gets a little crazy. My team and I prepare for the busy times. There’s a plan in place and we’re ready to roll. But, is it stressful? Some days it can be. Just like yours, my life gets stressful too. How we survive these periods is all about our coping skills and stress management habits. My goal for this article is to provide a little education about stress and a lot of encouragement for increasing your coping skills and improving your ability to manage stress. But, before we get into managing stress, first we need to understand it. A friend of mine gives what she calls a “whiteboard talk” on stress – in other words, the key points you need to know. I’ve included a few of the most important ones here. If you’ve already got the background, skip this section. If not, definitely read Stress 101 – you’ll be glad you did. If you would like more on the subject of stress, send me a note and I’ll consider a more in-depth educational piece for a future newsletter. Stress is defined as the non-specific response we have to demands placed on mind and body. In other words, everything causes stress. From the moment we wake, to the moment we sleep again, life is filled with stressors. All that we do, good or bad, pleasure or pain – it all causes stress. Disheartened? Don’t be. There’s good stress and there’s bad. The two kinds of stress are positive (eustress) and negative (distress). We can move from positive to negative with changes in quantity (too many stressors equals negative stress) and quality (the nature of the demand). In other words, car accidents cause negative stress, but the way we interpret other events in our lives can cause negative stress too. What is interpreted as “stressful” to one person may be a non-threatening event to another, adding to the overall stress level, but not causing negative stress unless you think it will. Stress is married to performance. The right amount of stress leads to peak performance and too much stress leads to poor performance (visualize an inverted U). Hoping to do your best? You’ll need some positive stress. I do a lot of public speaking and I’ve learned through the years that there’s such a thing as being too relaxed before I present. I need a little stress to get my adrenaline flowing. It energizes me and helps me to connect to my audience. In the right amount, stress is the necessary ingredient for success. But, how about those of you who turn to puddles at the thought of public speaking? The experience creates massive amounts of stress, and instead of fueling performance; you become physically and mentally overwhelmed. Under negative stress, we suffer physically (dry throat, sweaty palms, racing heart, sick stomach, etc.) and mentally (forgetfulness, anxiety, etc.). Possibly, you’ve experienced this. It’s not pretty – it’s painful. Each of us has a threshold for when our stress level becomes too much and our performance is hindered. Finding our threshold, our tolerance for stress, is an important goal and requires self-awareness. Acute experiences of stress, like public speaking for some, are easy to spot, but how about chronic stress in our lives? Have you been living with it for so long that you no longer recognize it? When we are under the weight of too much stress, our bodies send out signals like warnings flags. When we know what to look for and we listen to our bodies, we manage stress better. How does your body warn you when you’re under too much stress? Maybe you suffer cognitively or emotionally. You might experience increased levels of anxiety, tension, worry and fear. Maybe you suffer physically. Do you experience stomach pain, muscle tension, joint pain and headaches? Do old injuries flare up when your stress level is elevated? Or, maybe your red flags are changes in behavior – too little or too much food, too little or too much sleep, smoking, drinking, no workouts, poor anger management… Sound familiar? Add it up and you have the mind/body/behavior triangle – our personal relationship with stress and the built-in warning system we have. There is no better barometer of stress than our bodies. Start listening to yours. I’ve always believed that we can improve our stress management skills if we only attend to four things: exercise, nutrition, sleep and prayer. These will remain my top four, but there are others to consider. Here are 6 key ideas for improving your coping skills and your ability to manage the stress in your life. § Start with physical conditioning. If you struggle with this, then do it first thing in the morning (5 am or 6 am). Get a trainer, attend a class, set goals, listen to great music, find a workout accountability partner or get involved in a competition. We just celebrated the completion of our Biggest Winner Contest and this year’s winners were Jason and Carey Texler who lost over 100 lbs in 6 weeks because of their complete commitment to health and fitness. Jason’s and Carey’s “all-in” attitude contributed to their team’s first place achievement and their share of the $5,000 prize money. But, the longest lasting effect of this level of commitment is the impact it will have on their physical and mental health. That’s the real prize. § Make sound nutritional choices. Eat like a king or queen in the morning, a prince or princess at noon and a pauper at night. Plan ahead for trouble zones: air travel, late night hotel arrivals, lunch and dinner presentations that cause you to miss a meal, etc. Pack some meal replacement bars. Research restaurants that offer healthy options. A great idea I heard from a client is to refuse the menu (too many temptations) and order without one. Ask for simple fish, grilled chicken or petite lean steak prepared without oil or butter; lots of steamed veggies and a side salad without dressing. Request dressings or sauces served in a very small portion on the side (or not at all) and you can’t go wrong! § Create “holy” time. This is time for YOU. Read, pray, meditate, listen to great music, but take time to nourish your soul. How often do the words, “I don’t have time to think” come from your lips? Hit the pause button daily and feed your mind with words and music that lift you up. We cope better with the reality of today when we have faith that tomorrow will be brighter. I like to have “holy” time in the AM before the kids get up but the bottom line is just get it in. § Learn to say no. Nothing reduces stress faster than turning off the flow of demands you require of yourself. And, while you’re at it, take some time off! Start small if you have to (half-days, three-day weekends), but we warned! Vacations are addictive. We all need more of what my good friend Wayne Cotton calls, “Mellow Yellow” time. A quiet afternoon, a lazy Sunday, a road trip… It won’t be long before you’re hooked and happier than ever. § Surround yourself with positive people. Research tells us that a strong and loving support system is highly effective in improving our abilities to cope with life stresses. Feeling low or overwhelmed? Phone or visit a friend. Invite a neighbor to go for a walk. Share your life with others and remember the power of laughter – it is the best medicine. Stay connected with the people who lift your spirits. Thank them for the impact they have on your life. We can’t completely remove stress from our lives. The good would go out with the bad. We need some stress in order to perform at our best. What we don’t need is excess stress – more stress than we can cope with successfully. Most of us struggle with life balance. We are challenged daily by professional and personal demands. The goal is to know our personal threshold for stress and to do our best not to exceed it. For me, the many hats I wear (business owner, leader, trainer, father, husband, presenter, coach, Head of the Under Armour Training Council, etc.) often pull me in opposite directions. Added to this, my role demands that I am “on” all the time for everyone. So, just like you, I seek peak performance but sometimes exceed my threshold for stress, and I too can suffer the consequences. For me, my back is my barometer for stress and it will often let me know when my stress level is too high. If I listen and pay attention, I am fine. I will go to bed earlier than normal, get a massage, get in a great workout, relax with a good book, or just stop to spend more time with the people I love. If I don’t listen, it could literally put me flat on my back and force me to slow down. How about you? Are you listening to your body? Start listening today. Every BODY deserves to be heard. and we will send to you. Check out this awesome video of my friends Sean Croxton of Underground Wellness and Josh Trent of Wellness Force & FitnessSD at the 2010 IHRSA Convention & Trade Show in my old hometown of San Diego, CA. The International Health, Racquet & Sportsclub Association (IHRSA) is the fitness industry’s only global trade association. This convention provides a tremendous opportunity for those of us in the fitness biz to check out the latest & the greatest in fitness equipment, nutritional products, to learn current fitness training & conditioning protocols by attending lectures and hands-on workshops, and to also meet & network with other fitness pros in our world of health & fitness. Enjoy! Be a part of the Skinny Jeans Makeover! The college recruiting process is often misunderstood by many parents, student-athletes, coaches, and fans. The fact is, the college recruiting process has changed dramatically over the last 10 years. College coaches are using all sorts of technology including: email, smart phones (Blackberrys, Iphones, etc. ), online recruiting databases, social media, and more to evaluate players. In summary the college recruiting process can be complicated to many student-athletes and families. The key to success is starting early, being proactive and remain consistent in your efforts to best position your son or daughter for the right college sports opportunity. It’s time to shed those extra inches and get ready for summer!!! Fitness Quest 10 has designed a program to help JUMPSTART your health and fitness plan to get you looking and feeling your BEST just in time for SUMMER! Did we mention… there is a GRAND PRIZE! **For the man or woman who loses the most inches combined around the hips and the waist during the duration of the challenge will win the grand prize!